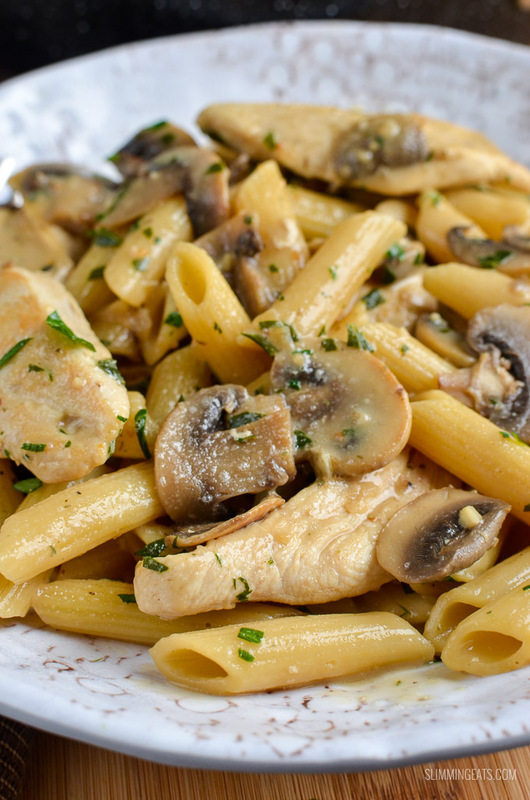 Syn Free Creamy Chicken and Mushroom Pasta – delicious and full of flavour!! 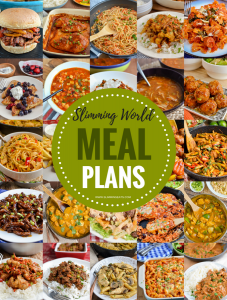 You know how it is, you really crave a bowl of creamy flavoursome pasta, but tend to avoid it on Slimming World because anything with the word creamy in the title, tends to be high in syns. 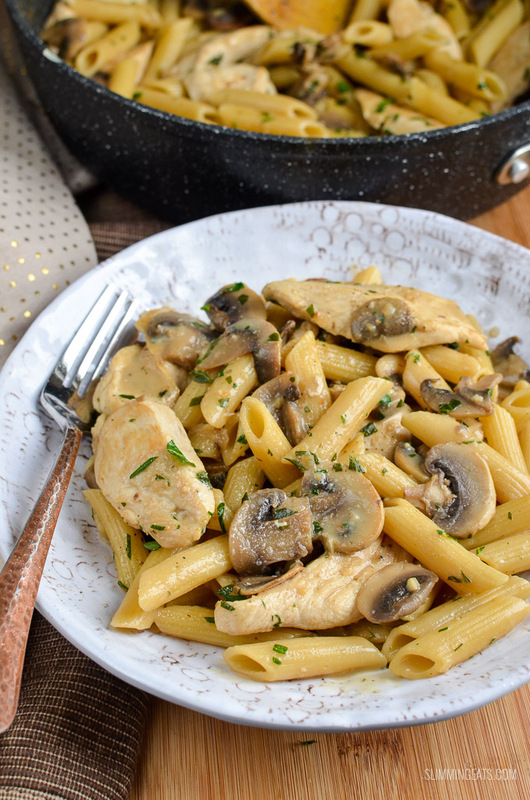 However with a couple of Slimming World friendly ingredients it is really easy to create you favourite creamy style dishes and one of my favourites in this Syn Free Creamy Chicken and Mushroom Pasta. 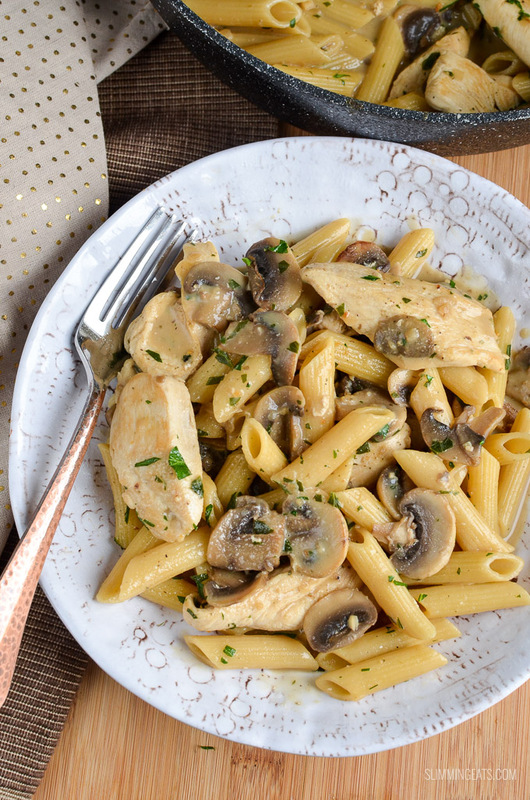 I have to admit I love chicken and I love mushrooms. I already have this amazing dairy free Creamy Chicken and Mushroom which is delicious with this Roasted Cauliflower Rice and some greens of choice. But for those of you that are not dairy free and want the pasta, then this is the dish for you. Did you know you can saute mushrooms and pack them with flavour without having to add lots of oil or butter which is high in syns. A neat little trick I have been using for years now, is to gradually brown the mushrooms with some stock. As it reduces down you can keep on adding more, and the result is beautiful golden mushrooms that taste like they have been sautéed in butter. I use this method for saute many vegetables now, from onions, to green beans, even the a onion, carrot and celery mix which is the base for many of sauces and dishes. To get the creaminess into the dish I use low fat cream cheese, adding this in with some stock until it reduces down into a lovely velvety creamy sauce is perfect. I use a similar method in this Steak with Creamy Peppercorn Sauce. So I figured it would be perfect for pasta. You can use the cream cheese as part of your Healthy Extra A allowance which makes this dish syn free, or syn it. The choice is totally up to you. 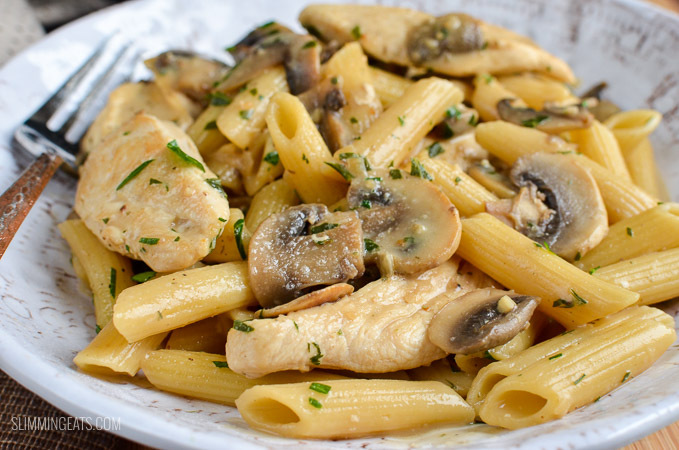 Reserving some of the liquid from the cooked pasta and adding it into the sauce, is another great trick for pasta type dishes, the starch from the pasta water, really helps the sauce, not appear thin and watery. I do this even with tomato based sauces. 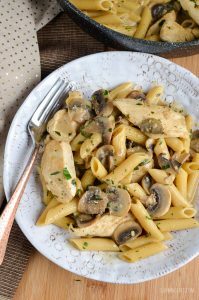 For this Syn Free Creamy Chicken and Mushroom Pasta, I find chicken breast works best rather than thigh meat. 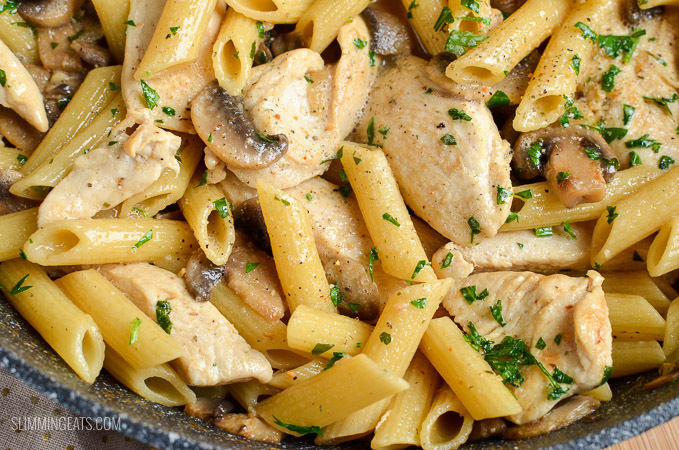 Hey this even tastes amazing with no chicken and all and just served as a mushroom pasta dish. My kids love this, and devour a bowl with no complaints. If you have a HEa spare, a little grate parmesan to the top just takes it that little bit further. For some speed foods, serve with a mixed green salad. 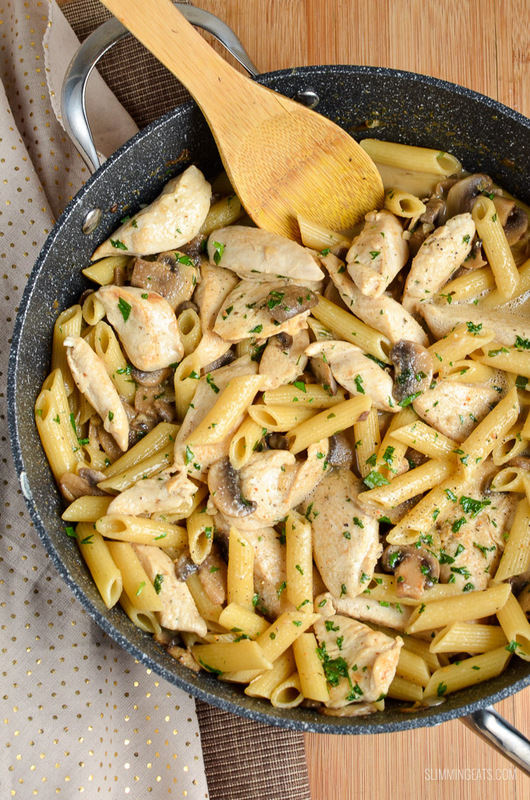 You can also make this Syn Free Creamy Chicken and Mushroom Pasta gluten free, but using a gluten free pasta of choice, my preference is brown rice pasta, as I find it to be the closest in taste and texture to regular pasta. All in all and delicious pasta dish for the whole family, and one that is super easy to make too. Cook pasta to al dente, reserve two ladles of the pasta water and then drain and set aside. Add the chicken pieces and fry until lightly golden on both sides. Remove and set aside. Add the shallot, garlic and mushrooms and fry for 2 minutes. Pour in a little stock and reduce down, keep repeating with a little stock, until the mushrooms are lovely and golden. Add to the pan with the mushrooms and bring to a boil. Simmer uncovered until the sauce reduces down and starts to thicken slightly. Add in the pasta and chicken and continue to simmer until the chicken is cooked through and the sauce has thickened. Low fat cream cheese can vary in syns, so be sure to double check the syn value of the one you use. If you prefer you can use the cream cheese as part of your HEa allowance or why not use some of your HEa to add a little parmesan to the top. Ingredients can vary greatly from brand to brand and therefore it would be impossible to give accurate information. You should always double check syn values for synned items. 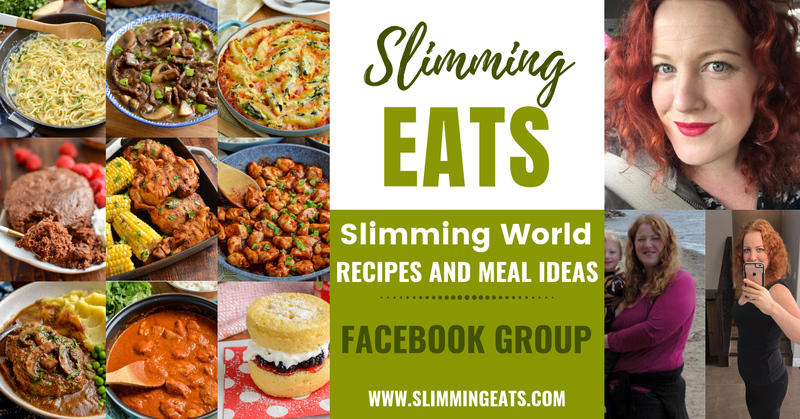 I am so excited to try these recipes. I have wrote down a bunch and bookmarked your page just incase I lose the pages!! It all looks so good. 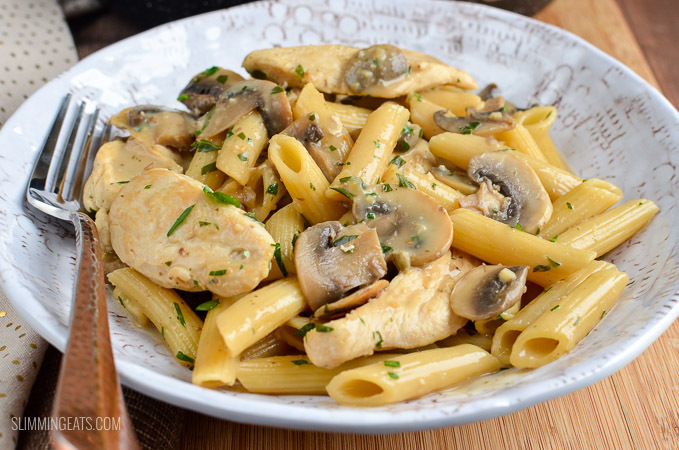 Love seeing all your recipes, must try the chicken & mushroom pasta, instead of using creamy cheese, could you use plain quark, which is syn free. 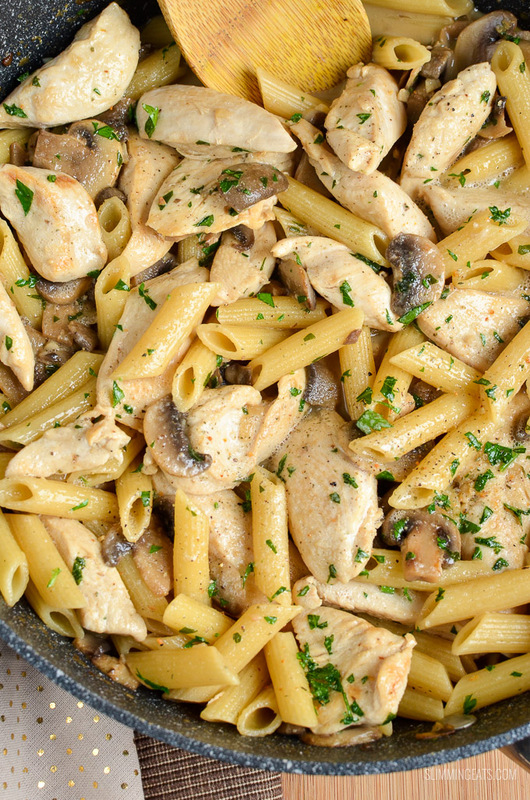 Can you freeze the chicken and mushroom pasta ? Hi Alison, it is best eaten on the day of cooking, but all ingredients are fine to be frozen. Hi there this sounds great apart from the cream cheese is there an alternative. You could use creme fraiche, cream, even coconut milk perhaps, but syns would need to be adjusted. Hi Vanessa, glad you enjoyed it. It shouldn’t be watery. It sounds like you perhaps didn’t allow the sauce to simmer for long enough. As the sauce reduces down with the starch from the pasta water, it will become a light creamy sauce. I’ve used quark in mine and it’s separating… should I have used quark?? the recipe states low-fat cream cheese, which is Philadelphia or a similar brand. Quark is more sour tasting and has a tendency to split when added to dishes like this. So is not recommended. Hi sorry is it 8 teaspoons of cream cheese or table spoons? Sounds lovely. I have also made sauces using the pasta water and it works brilliantly. This was super-tasty! Thank you so much for sharing your recipe. Tried this recipe with Philadelphia Light as my Healthy Extra, was a lovely dish. Really, really yummy. thank you Lisa, so happy you enjoyed it. I am sure it would, enjoy!! Hi Patricia, I am sure you could, but haven’t tested it by that method yet. Made it today, superb, thank you.